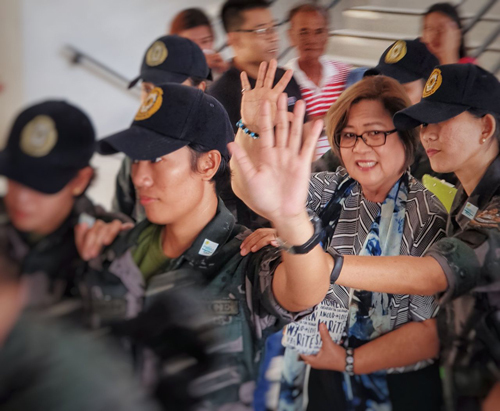 Muntinlupa RTC Branch 205 Hearing: Opposition Senator Leila M. de Lima smiles and greets well-wishers as she arrives for the continuation of the hearing on the trumped-up illegal drug charges filed against her before the Muntinlupa Regional Trial Court (RTC) Branch 205. On April 4, Sen. De Lima filed an Urgent Motion for Furlough to allow her to vote thru "escorted detainee voting" at her precinct center in Parañaque City on Election Day (May 13). The Prosecution raised no objections. Branch 256 granted the motion earlier today while Branch 205 has submitted the same motion for resolution.